Last weekend my parents came up from Florida to visit during the National Folk Festival. Th festival was so fun that our diets consisted of festival food, which was delicious at the time, until I hit a wall on Sunday night and asked my parents for a real sit-down dinner. As luck would have it, I got two. My folks had car troubles and stayed an extra day. So, I immediately asked my Dad to spend the bonus day making a big batch of his delicious spaghetti and meatballs. This is a time consuming recipe that is totally worth it (and you skip cleaning the stovetop by not browning the meatballs!). The recipe makes a big batch but is perfect for freezing small containers in small portion sizes. They reheat very well for week night last minute dinners. 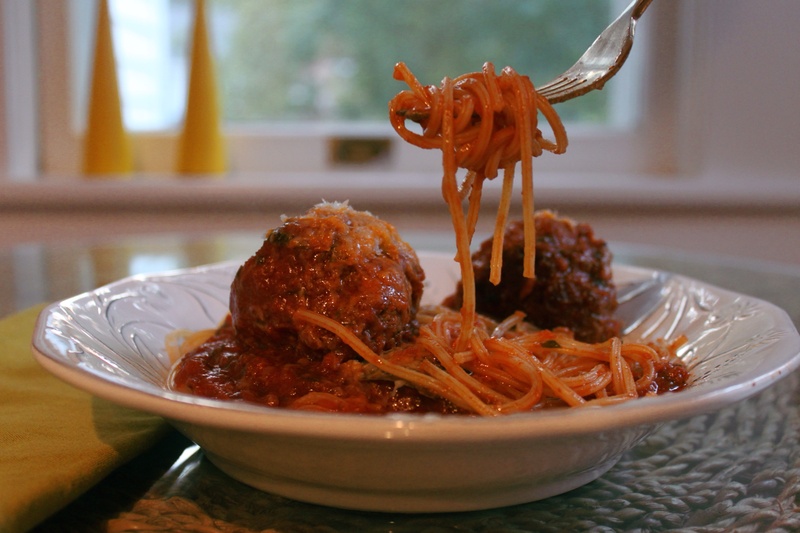 Dad recommends using spaghetti rigatti – it holds the sauce well. Sauté al vegetables in olive oil until transparent. Add remaining ingredients and bring to a boil. Turn down to simmer and begin making meatballs. Mix ingredients, make into meatballs. Drop carefully into sauce. Continue cooking 6 to 8 hours.